"Ginger, you are the spark that ignited a glorious fire," my friend stated last week. And, I suppose it's true. I wrote a post and shared a story about my son. I took the time to assign a hashtag and start a petition. I linked a few different options for getting Priceline's attention. I was passionate in my stance and motivated in my defense for orphans. I thought a few people might read my post and share their feelings with Priceline. But you. YOU. You all stepped up and ran with the campaign. I may have been the spark, but you caused the fire. You turned up the heat. You shouted louder than I could have imagined. You shared, you commented, you posted your adoption pictures. You made phone calls, you signed a petition, and you informed your friends and family. You stood in agreement that the ad was distasteful and should no longer be circulated. And together, we accomplished our goal. The director of communications from Priceline called me; meetings in their offices were being held. She and I talked for quite a while. She heard my story. She listened to my concerns. Repeatedly, she mentioned what an influential and passionate community of people I have. In light of recent conversations surrounding priceline.com's Baby ad, we'd like to clarify that we certainly didn't mean to offend. At priceline.com, we are committed to being there for our customers, no matter what life journey they are on. The humorous scenarios depicted in our new advertising campaign are not meant to reflect reality. We took a comedic approach to dramatize the "go/no go" travel decision moments many of our customers face daily. Based on your feedback, we have decided to pause the use of the Baby ad to evaluate messaging. Thank you for reaching out to us. Rest assured that we have heard your concerns about the message and content of this ad and we are taking them seriously. As of Sunday night (2/21), Priceline's distasteful adoption ad will no longer be playing on TV networks or digital streaming channels. Together, as we raised our voices to #shouttogether, we gained Priceline's attention and the attention of orphan advocates from around the world. As my friend said, a glorious fire was ignited for this cause. On my blog alone, 25,000 people read Nasko's story and were educated about the hurtful nature of Priceline's ad. From my blog's Facebook page, almost 40,000 people were exposed to the blog post. Shortly after I published my post and it began to spread, Live Action News decided to run our family's story on their website. The article generated thousands and thousands of views – holding the number one spot on their news site for three days. Nasko's story on my blog was shared on Facebook more than 1,500 times. It was shared from other news sources at least that many times. 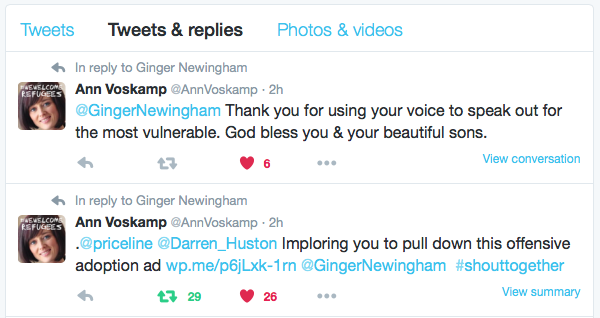 Ann Voskamp (a Christian author) tweeted and joined us in asking Priceline to remove the ad. She has 150,000 twitter followers. Life News, Central Parents, and The Mighty also picked up the story, and shared it with thousands more followers. Over 2,000 people signed the change.org petition to stop the use of the ad. The YouTube video of the adoption ad received 850 "thumbs down" and hundreds of comments asking Priceline to remove it. The Priceline Facebook page probably received the most traffic, as thousands of people begged Priceline to change their marketing techniques. Those are the known statistics. The unknown statistics are what I hope had an even bigger impact. Because we chose to shout together against Priceline, maybe those who have been affected by misrepresented paperwork did feel our support. Because we chose to shout together against Priceline, the orphan crisis did return to the forefront of our society's concerns for a brief moment. Because we chose to shout together against Priceline, maybe one more family did decide to take the considerable leap into the process of adopting a child. Because we chose to shout together against Priceline, maybe one more child will gain a family. When we #shouttogether change can happen. 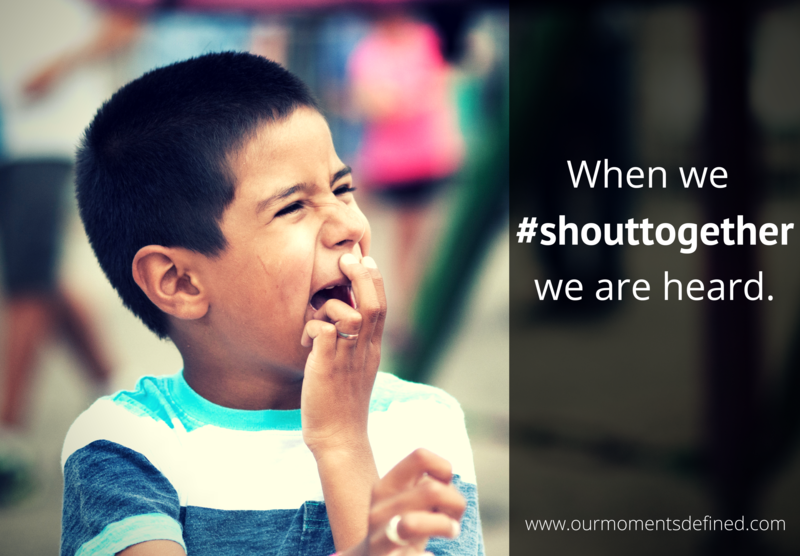 When we #shouttogether, we are heard. Thank you to every single person who joined this campaign and shouted with me. If you don't mind helping me get the word out one more time, I'd love if you'd share this post so that everyone involved will know that their voices indeed made a difference. Finally, don't be afraid to thank Priceline for listening to our feedback and making changes because of it.